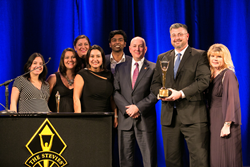 A diverse group of organizations and individuals around the world are among those recognized in the customer service awards, contact center awards, business development awards, and sales awards categories. A diverse group of organizations and individuals around the world are among those recognized in the customer service awards, contact center awards, business development awards, and sales awards categories. Among the organizations with the most finalists are Carbonite, Inc. (Lewiston, ME USA), Delta Air Lines (Atlanta, GA USA), Deutsche Post DHL (offices globally), Festival Walk (Hong Kong, China), Guidewell Connect (Jacksonville, FL USA), HomeServe USA (Norwalk, CT USA), IBM (Armonk, NY USA), John Hancock Financial Services (Boston, MA USA), and Vizio, Inc. (Irvine, CA USA). For a full list of Finalists by category, visit http://www.StevieAwards.com/Sales.